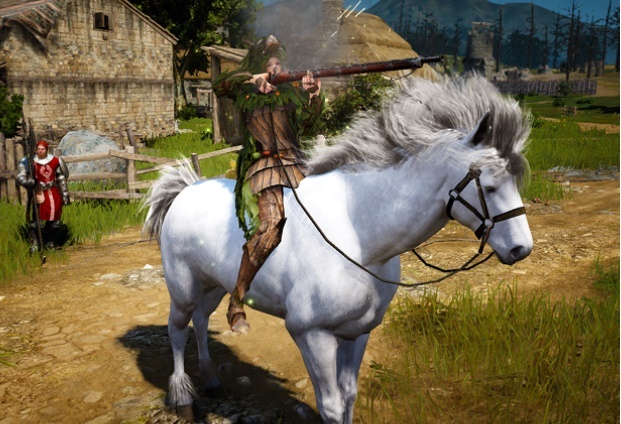 Black Desert Online has released their own official beginner’s guide to hunting on the forums. For a more indepth look at hunting, see my own guide to hunting created a few months ago. 1 Hunting! I Choose You! Have you ever seen the announcement “Blue Whale has appeared” in the game? It may seem like none of your business at first, or, something out of your league. This is not entirely wrong, in fact. The above announcement means somewhere in the ocean a Blue Whale has just appeared. They are large monsters, meaning you cannot hunt it single-handedly. These are monsters for hunting as a cooperative group with guns, which can be quite scary for the novice. However, that does not mean it is out of your league. While it requires multiple players, a hunting gun and a mount or boat, this is all it takes to participate. So get out there and bring some friends along and give it a try! 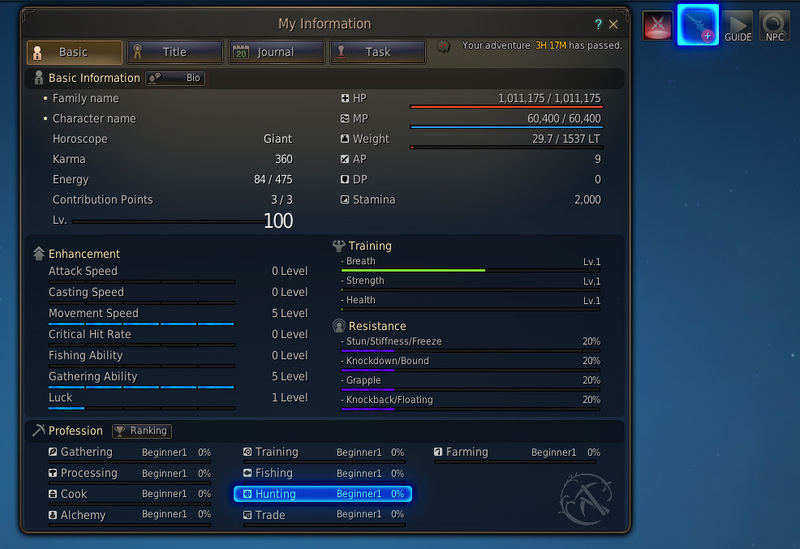 ▲ From your character window, you can see the hunting level from the life section. From the image above, you can check out the “hunting” level. 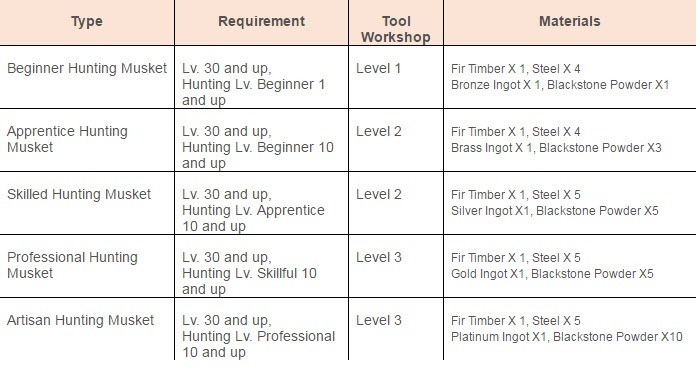 Those of you that have not participated in hunting before will be at Beginner Lv 1. Follow this guide to hunt a few Blue Whales, and your hunting level will go up in no time at all! Let’s take a look at the top-right corner of the screen. Look at the handgun icon, and it will sometimes display a plus(+) icon, which means a raid hunt monster has appeared. A Blue Whale in this channel, in our case. The emergence of the two monsters varies by channel, therefore it is recommended to share such information between players of different channels. Just as you stock up gears and potions before combat, you need to prepare for hunting too. Nothing fancy, though. Hunting Monster are not affected by normal attacks. They will only receive damages from hunting muskets. These muskets are not sold in shops and must be crafted by yourself, which can be done from a tool workshop. The level of the musket is determined by the level of the workshop so keep this in mind. If you are too lazy to make one yourself, you can also buy it from the Marketplace, check out the Main Weapon section to find a musket that is right for you. Please note that it is possible to enhance hunting muskets with black stones (similar to enchanting a weapon). When it reaches the enhancement level of +7, there is a chance to fail enhance and subsequently reducing the enhancement level. You may challenge to break through the ceiling of +7 when you are confident and well-funded. Since Blue Whales are on the sea, you would naturally need to be on a boat. Because multiple players can board the boat at the same time, if you know someone who has a boat, then you may be able to tag along for a free ride. This is important. Butcher knife. Even if you have prepared everything stated above, it is no use without a butcher knife. If you want to gather from any hunting monster, you must use a butcher knife. You have to equip it beforehand especially if you are on the sea, since you cannot visit the loyalty shop on the sea. 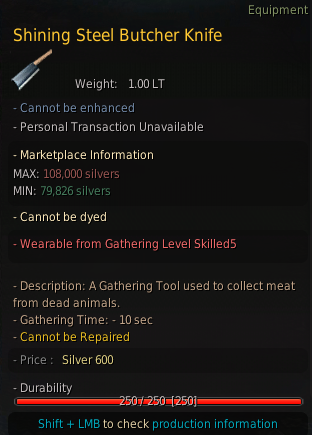 There is a variety of butcher knives for character of all levels, but anything should work fine. Just don’t forget to check if the knife’s durability is enough. Once you are all set, you should prepare to go hunt a Blue Whale once one spawns. In the mean time you can try some solo hunting monsters to get the gist of it. There are Humpback Whales on the sea, and Freshwater Crocodiles on the land. This guide recommends Freshwater Crocodiles of Lake Kaia, since it can take a long time to find a Humpback Whale on the sea. Do not equip the hunting musket the moment you arrive at the lake. 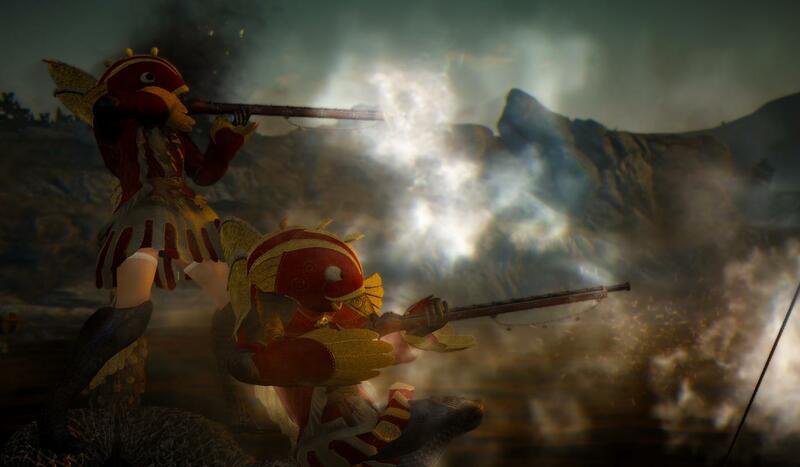 Holding a hunting musket will slow you down, and you may get hurt by Catfishmen. Walk around the lake, dodging or fighting Catfishmen on the way, and you will find Freshwater Crocodiles. Observe its routine, pick your spot, then equip and shoot the Hunting Musket to hunt the crocodile. The dead body of Freshwater Crocodile will float on the lake if you successfully killed it, you may get on top of the body to butcher it with a knife. Now you can earn some hunting EXP after finishing gathering and looting the monster. Please note that if you push the space bar while holding a Hunting Musket, you will switch to the sitting firing position. It will increase your fire range. ▲ Finding and hunting big Freshwater Crocodiles can be quite fun. You can only use the Hunting Musket on the land. Observe the crocodile’s moving route and fire whenever you have a chance. After killing it, get on top of its body and butcher it with a knife to obtain hunting EXP, meat, and the like. Not only is it enjoyable to hunt Blue Whales and Fugitive Khalks, but the reward items they yield, Blue Whale Molar and Khalk’s Shiny Claw, respectively, are more than worthy. Blue Whale Molar Earrings and Fugitive Khalk’s Earrings, made with Blue Whale Molar and Fugitive Khalk’s Shiny Claw, respectively, are sold at high prices on the Marketplace. In case of the Blue Whale, it appears three times a day per channel. The exact time of appearance is, of course, random. There is nothing particular to note when hunting these. 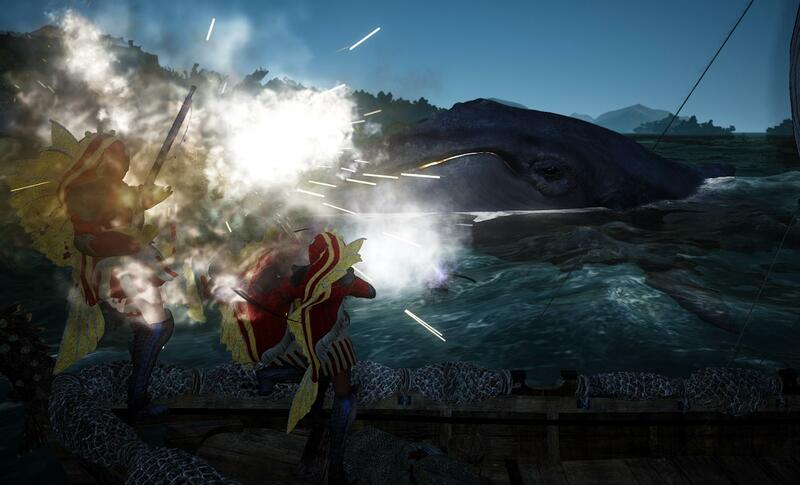 Since Blue Whales are quite fast, one of the party members should be sailing a fast boat (fishing boat) to chase the whale while others keep firing. The Blue Whale has an incredibly large amount of HP, so cooperating with other parties is recommended. The picture above shows the route of a Blue Whale. Remember that the Blue Whale will move freely along the line. 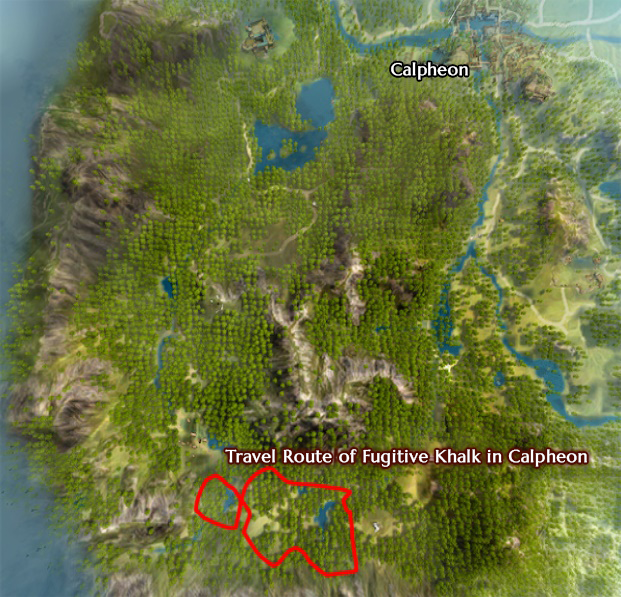 Red line indicates the whales in Calpheon, yellow line indicates Balenos, and blue line indicates the whales in Mediah. If you are a first-time whaler, observe the world chat first. 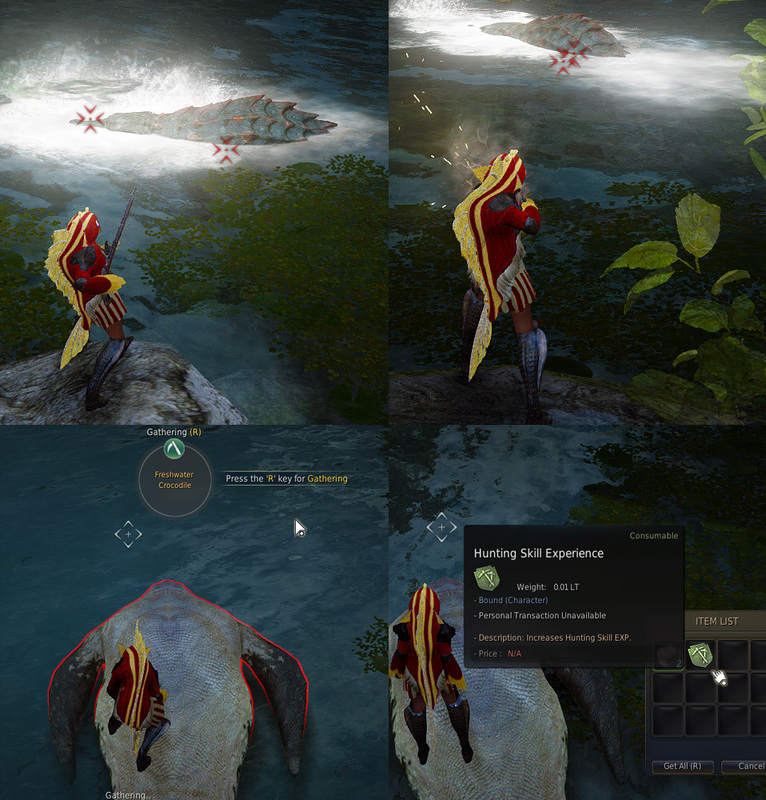 You will occasionally find other players asking for Blue Whale’s whereabouts, and there are a number of “Professional Whalers” in Black Desert Online. Get to know those guys and join their party to learn about whaling. Recently, it seems that focused hunting parties with high hunting levels and powerful muskets were formed. Joining such parties will enrich your hunting experience. If you succeeded in killing a whale in any way, then it is time to loot. The loot right goes to the top 5 contributing parties, and party members will get one chance per player to butcher the whale. Blue Whales might yield various rare items in addition to the molar. ▲ Team up with others to put down the whale faster. Be sure to remember that it is a party looting. 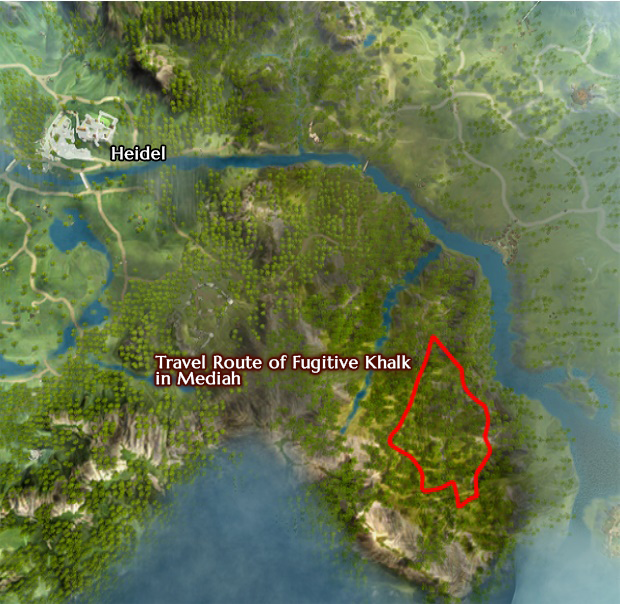 Fugitive Khalk appears in southwestern Calpheon around Longleaf Forest and around Tungrad Forest and Hasrah Cliff in Mediah. Khalk is in the air. Be sure to ride your horse to chase it. Fugitive Khalks, unlike Blue Whales, appear only twice a day per channel. It spawns randomly throughout the day. If you want to hunt while riding your horse, do NOT equip your musket while riding the horse. Be sure to equip your musket BEFORE getting on your horse to execute proper mounted hunting moves. ▲ You have to equip your musket before getting on the horse. The picture below indicates Fugitive Khalk’s travel route. Unlike the Blue Whale, it is relatively easier to find Khalk since its route is short and your movement is much less hindered. One little thing to note: You must be a good horseback rider. Observing the sky, riding the horse… You’ve got so much to do. However, you will get used to it after a few hunts. Looting rule stays the same as in the Blue Whale’s case. Only the top 5 participating parties can loot. Be sure to form a party when you go hunting. Fugitive Khalk is airborne, therefore a good understanding of the surrounding geography and good control of your horse are necessary. You may feel a bit clumsy at first, but that feeling should go away after a few hunts. Maybe it’s just me being a nooblet .. but it’s titled ‘beginners guide to hunting’ .. yet you are talking about hunting whales and alligators/crocs … how about how to get there rather than ‘being’ there already. I want to know how to get the early levels and where to find out how to hunt xp .. tried once and gave up because of lack of decent info to learn more. You can easily hunt Crocs from Biginner 1. This is ~outdated. 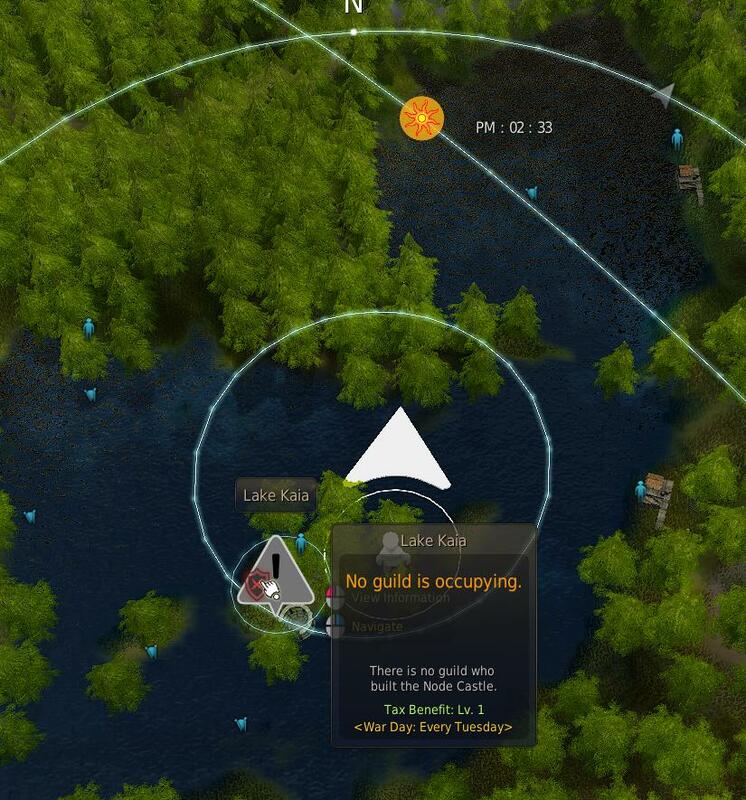 Now you can easily reach Skilled level in Hunting by hunting some bears, elks, foxes, wolves that spawn in few places in the world. The fastest way to lvl-up hunting is to do dailies (NPC in Balenos Mountains near Olvia). A rather “meh” guide which is way out of date and has fallacies.. Upgrade your musket to +7 without problems?? That’s not what happened to me. From +1 the Musket I got from the first hunting quest above Olvia had a chance to fail upgrade and by the time I got it to +6, it had to low durability to take anymore enhancements.